Access to digitized manuscripts online (see Irene’s Navigating the Digital World) is changing the way medievalists can and are expected to work. While the benefits of accessing an electronic facsimile for research with respect to preservation and efficiency are obviously enormous, there are numerous reasons why I’m glad my current research requires hands-on interaction with my subjects (in amazing Bruges, no less). The physical element of codicology is partly why I was drawn to studying medieval books as objects, rather than for the texts they contain. 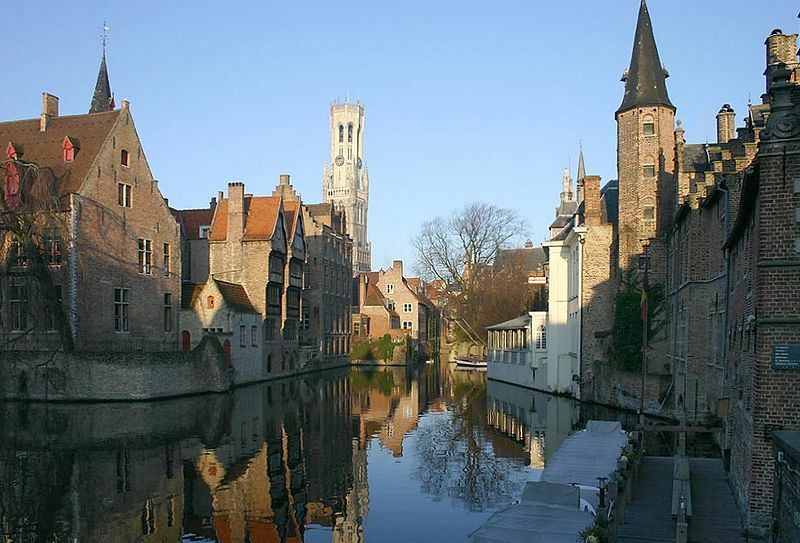 Beautiful Bruges. If you haven’t been, go. Traveling through the Flemish countryside on my way back from Bruges provides a great backdrop to consider my research trip and the manuscripts I’d explored over the past few days (with the gracious cooperation of the Biekorf Library’s leadership and staff). While, of course, I run through my usual checklist of paleographical features which can be done on-screen – pp biting? Ampersand or tironian note? Minim direction?… – there are a number of features that I can only properly identify in the flesh. My research on Ter Duinen’s twelfth-century collection requires that where possible I determine which manuscripts were homemade and which acquired from elsewhere. Many of the minute features that often photograph very poorly are important clues to the patterns and habits of a scriptorium. In just a small sample of manuscripts I found many physical features that just wouldn’t show up well using the digitization techniques employed by most libraries (and I must note, only a couple of the ~90 manuscripts I’ll study are digitized). For example, there was inner margin pricking (typically Cistercian) on a few manuscripts which required a gentle push at the binding and sometimes the use of a small mirror to confirm. I can also tell, from the tiny hole shape, positioning, and pricking errors, that quires were folded and then pricked together in a stack, which would be tricky indeed to see in 2D. A faint (especially on camera) but drastic change in ruling techniques in one manuscript announces two codicological units made in different scriptoria (not obvious by looking at the hand alone), while other internal evidence tells me that these two works were bound together since the Middle Ages. Taken together these small details begin to tell a story of how Ter Duinen’s monks made and used their books. In addition to purely visual, technical observations, hands-on research is a more physical experience. You smell, touch, and hear so much more than a computer screen, photos, or microfilm allows. I have a tendency, and I’m sure I’m not alone here, to discretely sniff every book I open, searching perhaps for a whiff of medieval sheep, eau de medieval monk, or musty monastery library. 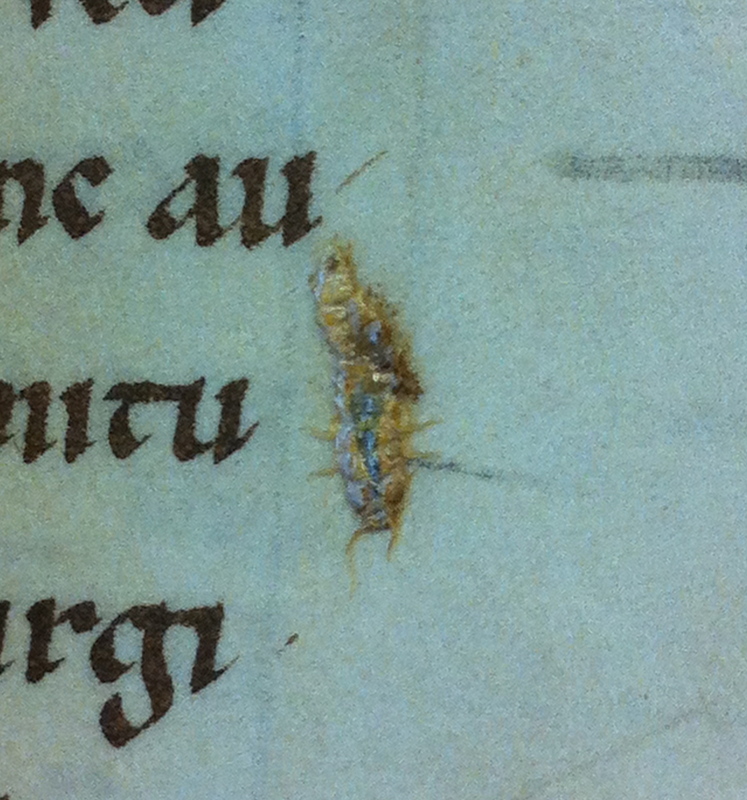 However, one manuscript threatened me with a powerful sneezing fit every time I leaned in for a closer look. 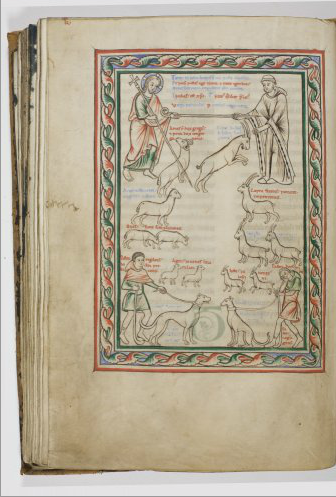 Sheep, goats, and a monk. Can you smell them? Allegory of the Good and the Bad Shepherd, c. 1190-1200. Brugge, Grootseminarie, MS 89/54 , f. 115v (The Ter Duinen Aviary). Another manuscript crept out of the vault with hair. Its medieval binding – dense, dark brown, and rather appealing in its ugliness – wore patches of the fur of the cow it had once belonged to. It was both something that begged to be touched, and also vaguely off-putting. An online photo wouldn’t do this furry little book justice. The Biekorf requests that photos taken by researchers be only privately used. 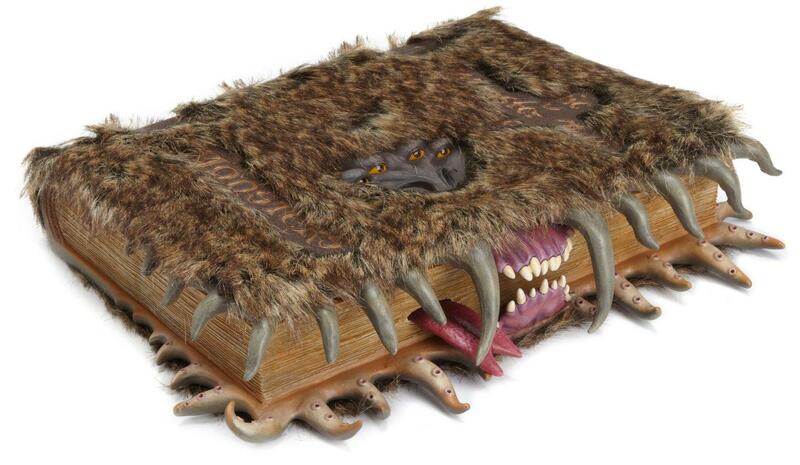 Here’s a slightly more dramatic version of a hairy book from Harry Potter. The last manuscript I requested was quite large. Of course, measurements are listed in the catalogue, but that doesn’t always give you the full picture. At 30cm x 40cm it covered my whole desk. With 249 folia and a very hefty 17th-century binding it did its best to give me a workout while lifting it from its box, and also did a bang-up job in squashing the display foam I set it on. It was in excellent shape and, although I always handle manuscripts with the utmost care, it needed no handling delicacy beyond the ordinary. However, its binding was tight, and every few page-turns resulted in significant crackles and pops. I was the only person viewing manuscripts in the reading room, and the sound caused other readers to look up anxiously from time to time. I was worried they’d think I was torturing the poor old thing. 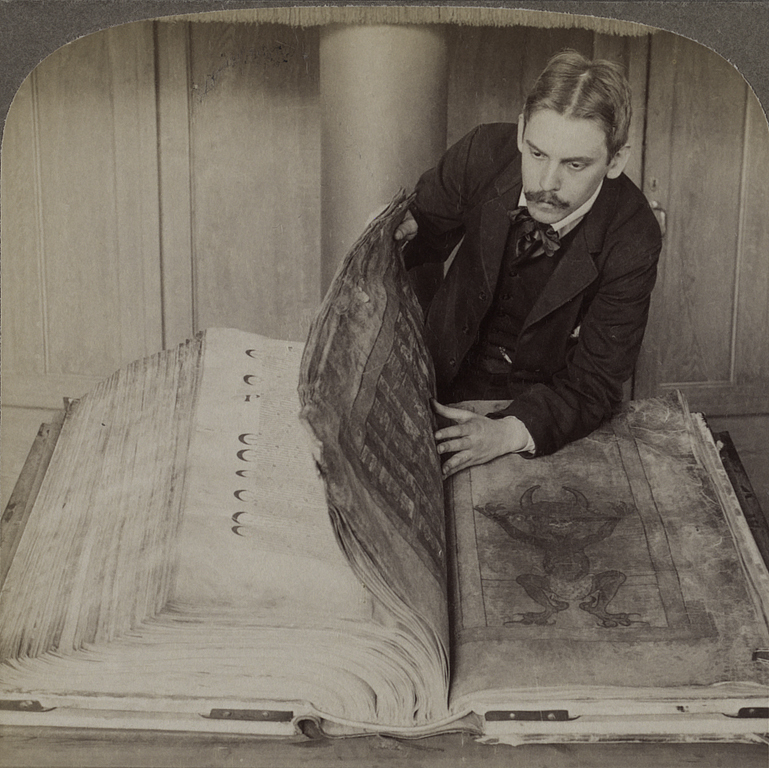 Okay, so my manuscript wasn’t this big, but I did feel a bit like this guy with the Codex Gigas. One thing I encountered that actually showed up better much better on camera (as I discovered when I zoomed in with my iPhone) was this bookworm. When I first turned the page I thought I’d found an errant piece of gold (which would have been a bit atypical in my collection) because it shone so brightly. On closer inspection, it was a very old, very squished bookworm. I can’t hazard a guess at how long he’d been there (my bookworm dating is remarkably less developed than my manuscript dating), but considering his probable love for manuscripts in life, this seemed a rather suitable postmortem resting place. It’s not only the intellectual aspects of manuscript study that appeal to me; the physical experience of research is also exciting. When my data has been collected and I can no longer justify handling this collection, it’s the memory of hands-on experiences (and of course the more ‘meaty’ findings) that will keep me passionate about my work in the stages of writing, proofing, and presenting my research. This entry was posted in Jenneka Janzen and tagged Codicology, Manuscript, Medieval Bindings, Monastic Scriptorium, Paleography, Research Reflections. Bookmark the permalink.